This week General Electric, the 8th largest company in America, announced that my city, and the very neighborhood I work in will be its new global headquarters. I’d like to share a thought or two of why this may be a much bigger deal to local culture than might be imagined. I should also remind everyone these observations are mine alone, and in no way represent the smarter, kinder, better-balanced people who surround me in my work and personal life. Boston is better known as a birthplace of revolutions and industries than as a capital of them. This fuels a perverse, and often one-sided, rivalry with other cities that have commercialized and grown things that started here. Babe Ruth before New York, Ben Franklin before Philadelphia, The Pixies—yeah that’s right, I can’t say they’re from LA, they started here. With the exception of technology, Boston’s revolutions have gifted it with leaders of numerous industries that stayed here. The academic freedom of nearly 70 colleges and universities, a biotech cluster that has made Cambridge the Hollywood of Life Sciences Research, and a concentration of teaching hospitals that makes it a healthcare epicenter all have roots in the early days of these movements here. Boston’s financial leadership is less well known. This was the birthplace of the nation’s first commercial bank in 1784, the first mutual fund in 1924, and arguably the first venture capitalist, Georges Doriot, who opened ARD in 1946. In some way, Fidelity Investments and State Street Bank are heirs of these early innovators. Massachusetts start-ups continue to have an advantage in proximity to funding, which even today sees The Bay State ranked as the top US state for innovation. Yet, in the city where Alexander Bell invented the first phone, where Aiken made the first programmable computer, Bricklin made the first spreadsheet, and the guys at Bolt, Beranek and Newman invented the Internet, Boston and Cambridge proper have exactly zero Fortune 500 firms with a digital technology focus. Changing that is as big a deal as reversing any basebaBoston is ripe to be a tech innovator’s company town. Having been a big part of both the Internet and the Industrial Revolution, it’s hard imagine a more natural home for a firm dedicated to inventing the Industrial Internet. Perhaps you’ve heard the Dukakis era slur that liberal-dominated Massachusetts is Taxachusetts. That’s changed dramatically, and GE’s decision is powerful new proof of that. GE picked Boston for lots of reasons: its high-quality workforce and pipeline of smart future hires, the state’s public education (if its scores were reported as a country its 8th grade science scores would be behind only Singapore), and its goal of putting its headquarters inside a greater digital/tech ecosystem. But the trigger that made it leave Connecticut was simple: taxes. 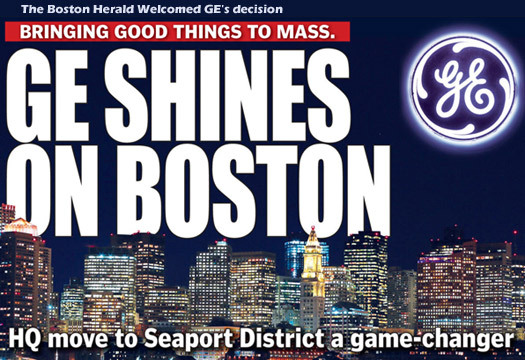 Of all the states that invited GE’s interest, GE selected Massachusetts. End of slur. Granted, $145 million in public funding was promised make this change more attractive. But Jim Stergios over at the conservative Pioneer Institute has a lot to say about this. He’s no fan of government doling out marketplace advantages; his analysis is that this gift is pragmatic and smart. Only $25 million of this package are city tax concessions, and the remaining $120 million from the state includes major capital improvements desperately needed by the fast-growing Seaport District which GE will call home. Rather than building a disastrous Potemkin Olympic Village for the 2020 Games, Boston, like GE, made a smart decision too. This connection creates a home for the talented technologists, managers and designers that so often begin careers here and leave to pursue distant opportunities. Boston’s roots run as deep in digital innovation as anyone’s, and this is a rare chance to bring them to bloom with a true global leader. We have a lot to work on as a city and region. But we also have every reason to be glad to be joined by one of the world’s leading manufacturers and inventors. Huzzah for GE. My Connective DX colleagues and I have seen the transformation of the rows of warehouses and parking lots that had been the Seaport into a creative hot bed that is home to LogMeIn, DataXu, Zip Car and a big part of NPR’s Digital Services Team. You’ll be in good company, and we’re looking forward to sharing the secrets of the Trillium beer line and the splendor of Envoy’s roof deck. Welcome to Boston.